Here is a film that will likely never receive the audience it deserves and that’s both a shame and quite unsurprising. Moviegoers can be a fickle, stubborn and hypocritical lot, often unable to dissociate themselves from an actor’s controversial off-screen behavior. So, with all the Mel Gibson hate out there for the past 5 or so years, it’s an obvious case of bad timing that his new film has been purposely dismissed or overlooked. That’s too bad, since this is a film that focuses on real issues that many families today must deal with. 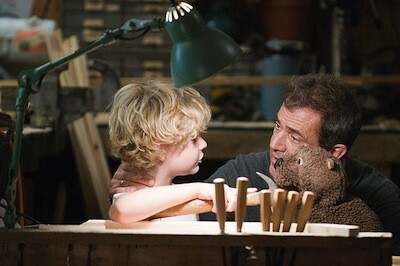 The movie opens with middle-aged Walter Beck (Mel Gibson) stuck in a crippling depression. As the CEO of a toy company passed on to him by his father, it would seem he’s doing pretty well. It’s indicated though that his father had demons as well, so his current condition could be hereditary. Regardless, Walter is now at the point where he is emotionally cut off from the world, sleeping most of his days away, in a blur of a deep funk. Walter is certainly suffering, but he’s not alone, his family is also feeling the effects of it all as well. His wife, Meredith (Jodie Foster, who also directs) has had enough and asks him to leave. It’s not an act of coldness, since we get the idea that she’s been patient for some time now. If anyone knows what it’s like to have a spouse just up and check out, it’s clear she’s had her hands full being there for their two boys, a job that would usually be shared by two nurturing adults. Henry (Riley Thomas Stewart) is their youngest, a quiet boy who is getting picked on in grade school. He’s not quite sure what is going on with his dad (maybe that’s why he’s so withdrawn), but Porter (Anton Yelchin), a senior in high school does. He knows all too well, resenting his father’s downward spiral, and is determined not to wind up like him. Porter is a smart kid, offering up top-notch term papers to the highest bidder, but he has understandably become embittered by his absent father. So concerned is he of becoming his father, that he has all of Walter’s traits and weaknesses jotted down on Post-Its all over his bedroom walls, serving as a constant reminder of where not to go. And then comes the titular Beaver. 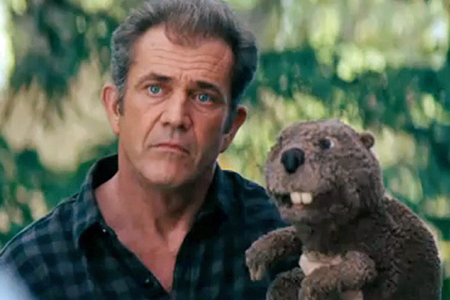 There’s no “Gee Wally” moment when Walter discovers this discarded beaver hand puppet in a hotel dumpster. Hmmm, maybe there’s a reason that ratty looking thing is tossed, but for whatever reason, it calls out to Walter in some way. He takes it back to his hotel room (intentionally, unintentionally? destiny? we’re unsure), finishes getting plastered watching a “Kung Fu” rerun and is knocked out after the TV falls on him. He wakes up with the Beaver on his left hand, who proceeds to abruptly wake Walter up in a Cockney accent. We are just as “What the….?!? !” as we think Walter might be, and he sort of is at first, but then something happens, something clicks. The Beaver becomes Walter’s voice, so much in fact that he goes around with a card that says the following, “Hello. This person is under the care of a prescription puppet. Please treat him as you normally would, but address him as The Beaver”. For the record, I would totally pass up this guy at a cocktail party – only because I could. But, this story is about those around Walter who now must speak to a buck-toothed conduit. There’s no avoiding it. Obviously, this is a bizarre concept for such a serious illness, but Foster deftly balances dark humor with wackiness, well enough for us to buy into the absurdity of it all. The best thing about “The Beaver” is it doesn’t water down mental illness, nor does it dump exposition to catch us up on where everyone is at. Instead, we are trusted to connect the dots on our own, something that many screenwriters deny viewers. Another great thing here is how we never really know what brought Walter to this state of depression. So often in Hollywood, there is an event (tragic death of family, loss of child, murder of a loved one, etc) that serves as the reason why a protagonist is struggling with mental illness. It’s clearly for dramatic effect, but the majority of people with such a condition don’t have one particular occurrence that explains the origin of it all. It’s often something that has developed over time; through various pressures, failures, and stressors, they find themselves unmotivated and numb. 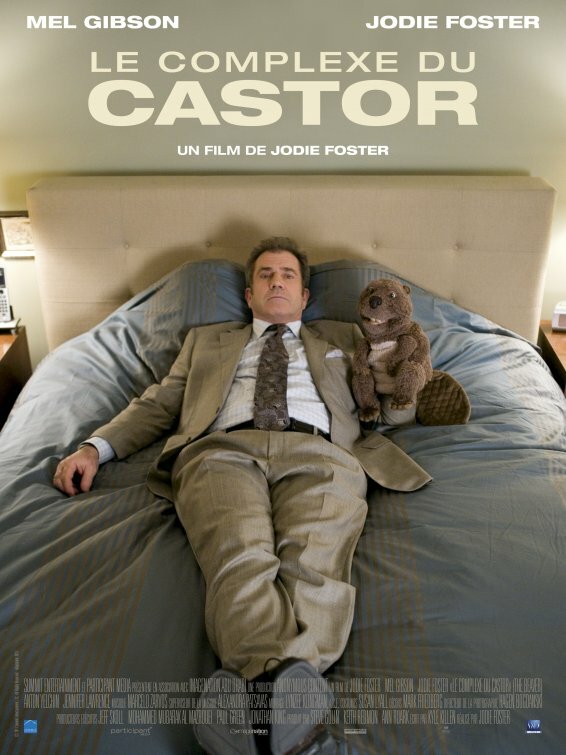 That’s how I see Walter and even though he has his puppet, he comes across as an honest and real person, thanks to Gibson’s excellent performance. In fact, I can’t think of any other actor his age pulling something like this off. Say what you will about Gibson, he’s always been one to choose his roles for the character on the page, not because of the type of character he is off-screen. In this case though, he probably connects pretty well with Walter and because of this, he delivers some of his best work in a while. 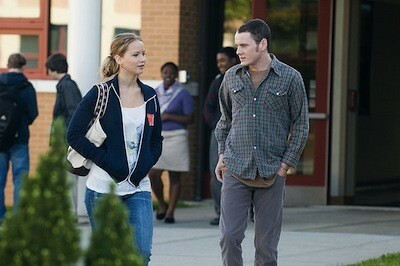 He has his work cut out for him here, especially in some emotional scenes with Yelchin. It helps that he’s supported by his friend Foster, both in the role of his wife and as director. Let’s be real: how many people are willing to risk taking a change on Gibson? While “The Beaver” has some great performances, it’s not a perfect film. Writer Kyle Killen (of the short-lived TV series “Lone Star”) tends to speed things up a bit too much. 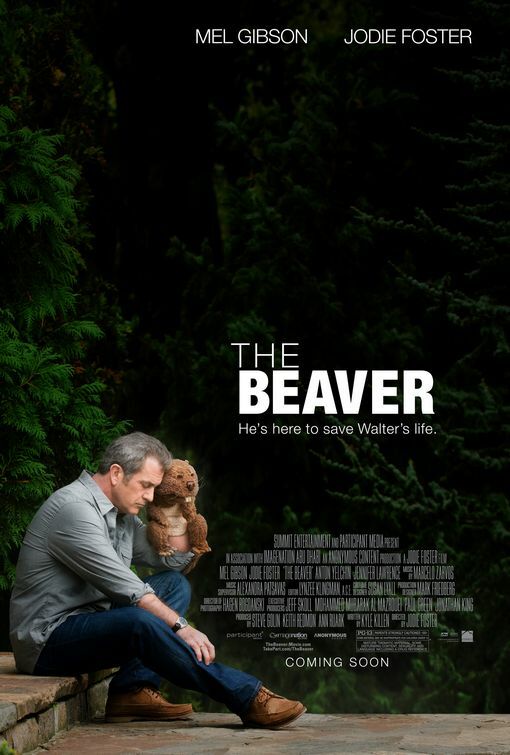 With the Beaver, Walter finds seemingly overnight success in his toy company, much to the disbelief of the VP (a spot-on Cherry Jones), after making some shocking change-up decisions. Such success would normally take months (at least), but we see all this transpire way too fast. There’s also a budding relationship between Porter and a classmate, Norah (Jennifer Lawrence, in a flat follow-up to her Oscar-nominated role in “Winter’s Bone”), that feels like it’s on subplot speed dial. That friendship would have been more rewarding with subtler beats than what Killen offers them. Despite some missteps, “The Beaver” remains a fascinating film that conveys genuine heartbreak and uncertainty with both a disturbing darkness and a looney seriousness. Foster could have gone all crazy with the premise or to an even darker place, but I respect what she presents here. I wound up comparing it to other films like “It’s Kind of a Funny Story” and “The Kids are All Right”, in the way it shows mental illness and the modern family. If audiences can get over their hang-ups with Gibson and just focus on the art, instead of the artist (it works with Polanski, doesn’t it? ), then they may just find an original story, and maybe even find someone familiar in it.